More flies causing annoyance as the hot weather soars – what can you do about the pests? As the country felt the full impact of the heatwave, the number of flies around reached peak levels. Have you been seeing more flies around your home this week? Here’s some advice on how to fly-proof your home. Experts say this increase in the presence of the pests is due to the life cycle of flies (usually 7-10 days) speeding up as temperatures rise, with flies reaching adulthood quicker. Environmental matters and lifestyle habits also factor in here as we leave windows and doors open to cool down, as well as eating and drinking outside in the sun. Richard Faulkner of Rentokil told TheJournal.ie that at this time of year flies “come in to more contact with us as we are more active”. Rentokil has seen a 74% increase in call outs lately for fly infestations and the best advice to avoid this happening is to keep surfaces, drains and bins clean as the temperatures increase. Outdoor barbeques, picnic areas and home kitchens can be hotspots as house flies are attracted to any foodstuff. When flies feed they are unable to distinguish between raw and cooked food, as well as food that has decayed or been digested in the form of excrement. 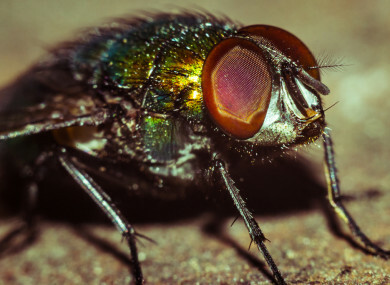 Flies often regurgitate their food and this can end up contaminating our food as “some of their last meal will make its way into your food”, said Richard Faulkner of Rentokil. Flies spread diseases by landing on food and they can also get trapped physically in our food or drinks and spread bacteria on consumption. The most common types of bacteria spread by flies are salmonella, campylobacter and e.coli. These bacteria can cause harm to humans particularly affecting the bowels, with people suffering from food poisoning and diarrhoea. Rentokil said avoiding an infestation of flies is “all about keeping the house as clean as possible”, especially cleaning up food preparation areas and surfaces. Never leave food out, keep food covered and collect your compost waste in an enclosed and covered container. Keep bins tidy and away from doors and remove waste regularly so as not to have them overflowing or left exposed overnight. Keep drains clear, and clean up after pets. To protect your home against house flies, insect screens can be fitted to all open windows and doors. Rentokil recommend to put down a glue board unit to catch flies, but keep this out of reach to children. Electric fly zappers can be used but it should be noted that the insect has to make direct contact with the unit and sometimes bigger flies may not be immediately stunned. The common plastic fly swatter is a handy tool to keep around the house but it’s always best to clean up afterwards as pieces of these flies can end up spreading further bacteria if not disposed of. Aerosol fly-killing sprays are another option but with the use of pesticides in the home, Rentokil advises people to always read the label and wear protective gear. It’s important to always keep these products out of contact with food and away from children. There are dozens of species of flying insects that are common to Ireland, but the most common is the house fly. Flies such as bluebottles are found particularly around rotting foods, and are attracted to high protein food sources such as dairy or meat. Fruit flies are attracted to rotting fruit or peel and Rentokil advises to cover fruit and always check for damages such as bumps or bruises. The cluster fly is common in rural areas, particularly on roofs and these flies will appear in the summer especially as they hibernate in winter. The beer fly tends to congregate around the sweeter liqueurs and cordials, while drain and sewer flies are usually present because of a drain being blocked with food waste. Email “How to protect your home from becoming fly-infested in the heatwave”. Feedback on “How to protect your home from becoming fly-infested in the heatwave”.